"In the meadow we can build a snowman..." I think I miss Christmas music or maybe it's all these snow pictures that are making me what to sing that song! A few weeks ago we had the most epic snow fall. It was snowing for two days non-stop and boy did the snow accumulate. 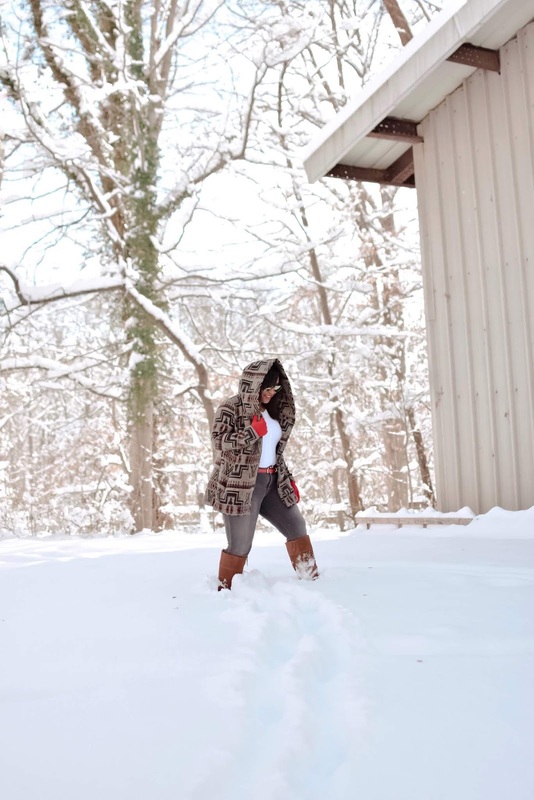 I always wanted to take fun snow pictures in the beautiful while snow but always chicken out because I'm too cozy in my house or just don't want to deal with the cold lol. This snow fall was just too pretty not to snap some pictures plus I got to wear my new hooded coat. You guys know I love thrift shopping and if you are new here, this girl loves to thrift shop and find gems. It's funny how one persons trash becomes someone else's treasure. I found this Mossimo coat and because of that print and hood I had to bring it home. The hood is my favorite part because it adds a nice style to it. The jacket may look light but it's surprisingly warm! I was going to save this jacket for NY next month but I couldn't wait to wear it and share it on here. Did it snow near your area this month? Did you brave the snow and cold for a picture like me? Haha! I also took out Leah in the snow this day and it was her first snow fall. I will be sharing a few pictures in a post with our first mommy and me look on here!